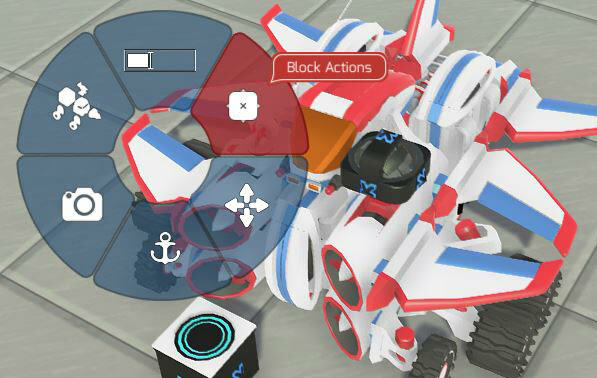 When controlling your tech, you can now right click to bring up and actions menu. While undoubtedly handy, it often gets in the way, especially when panning the camera or when close to another tech e.g. inside a hangar, multitechs with limited space. Please make it a toggleable option, preferably with a checkbox in the pause menu or something similar. Most of its functions can be performed by the other UI options, so I don't expect it to affect gameplay much. I was thinking that as they did the stream. its gonna get really annoying. That's why I think there should be a hotkey to open up the radial menu instead of right clicking your tech. Maybe a hotkey to open up the submenus of the radial instead of the whole thing. idk, I can't play terratech accidentally right clicking on my own tech constantly. I build too big for that. It's not something that I struggle with, but I know @Greg and @kae agree with you. As you say, we'll likely need an options menu choice to have the Tech Radial or HUD buttons on PC. I saw Lathrix stumble over this a couple times. I'm sure I must have too. Clicking your own tech doesn't really make as much sense on PC as console. Certainly it's way too fiddly for me to change control schemes via that interface (I just wouldn't use techs that require that). Being able to assign (and [un]assign) a custom key bind for this (and other things) might be ideal. So right click for now, and as a default, but allowing PC players to put it on another mouse or keyboard buttons, soon, with the next part of updating controls. If it had its own (assignable!) key to call it up, it'd be just like the Crysis suit menu. That was really easy to use once you memorized where to flick your mouse after opening. I worry that hiding it behind a keybind would make it harder to find for new Players. I've asked @kae to bug it and we'll likely give an options menu choice to switch between dedicated HUD buttons and the Right Click Radial. I worry that hiding it behind a keybind would make it harder to find for new Players. I worry that toggling the options menu every time you try to rotate the camera while zoomed in is going to make to make it hard to stand for experienced AND new players alike. Set it to default on, and let us disable it if we want fromt he gameplay options menu. New players dont have to find it, and people who know what they are doing arent perpetually annoyed and interrupted by it. We're talking about the new radial menu when you right click the tech you are controlling... OIC, the greyed out option is called "Block actions". That might actually make the radial menu handy for PC. But HUD buttons with a fixed position would still be better, of course. I definitely cannot cope with no longer being able to click anything to move the camera unless it's empty space. This is a detriment for big techs, for MultiTechs and is just kind of weird in general. Considering the menu cannot do anything that can't be done anyway, I suggest its trigger being set to scroll-click instead. We've made some improvements in the 1.0.1.6 Unstable that should prevent radial menus being activated accidentally when you meant to rotate the camera. This was inadvertently left out of the patch notes. Yeah, I've been noticing this quite a lot, this morning... It's going to take a lot of getting used to - the short delay you need to leave before moving the mouse to make a selection, now. I guess it's kinda elegant, but for no I keep rotating the camera instead of making quick selections from the various UI wheels. Particularly tricky if not completely stationary, I think.